Now that the Associated Press declared that Democratic frontrunner Hillary Clinton has crossed the delegate threshold, the former Secretary of State is set to be declared the party's presumptive nominee. There is a big difference, though, between Clinton's current situation and that of her Republican counterpart, Donald Trump: Trump was the last man standing, and Clinton still has a competitor left in the game. Vermont Sen. Bernie Sanders has made it clear that this could get "messy" in Philadelphia — could there really be a contested Democratic convention even though Clinton has won the required number of delegates? While Clinton has snagged the magic number for a Democratic nominee (2,383), Sanders had previously pledged not to drop out before the convention. 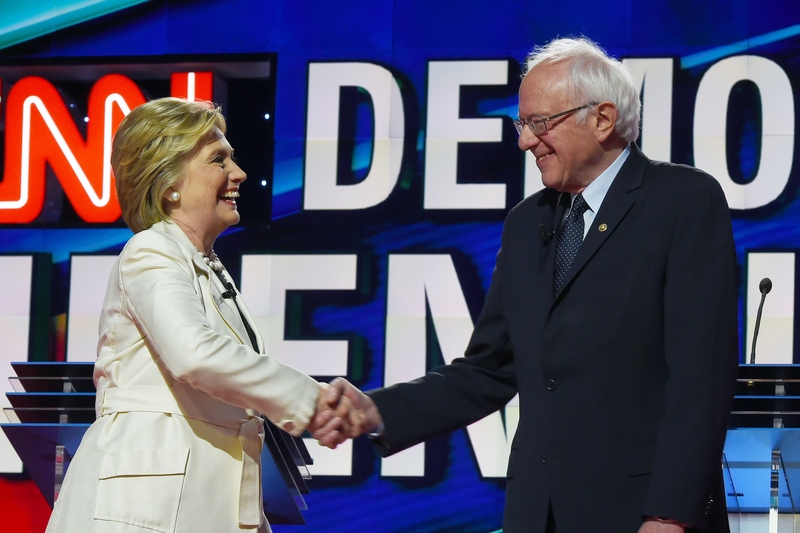 Clinton would "need superdelegates to take her over the top at the convention in Philadelphia. In other words, it will be a contested convention," Sanders announced at the National Press Club in May. Sanders' well-publicized declaration of a contested convention was made before the former Secretary of State passed the delegate threshold — and the Vermont senator is now in an uncomfortable position. It is still technically possible for a contested convention to happen because Clinton's 2,383-plus delegates involve superdelegates. Sanders can claim that unless Clinton hits that number with just pledged delegates, there's a shot the superdelegates she has will switch allegiance — and thus, that she doesn't have the nomination locked down heading into the convention. However, the likelihood of these superdelegates switching is pretty small, to be very kind. Many have argued that a contested convention would actually spur the Democratic party to more robust and lively debate; I've previously written that Clinton and Sanders have made each other better candidates. Still, Democrats know they need to be in their best shape to face Trump and the GOP — and to be in top form, they need to be unified. More likely than a contested convention, Sanders' high delegate count may help him influence some of Clinton's platforms in the general election, pushing key issues of his, such as health care and the minimum wage, for consideration in Clinton's agenda. While Clinton isn't obligated to take on Sanders' various platform points, it may be in her best interest to do so in some cases in order to appease his voters and keep them from running to Trump – or not voting at all, which might be as damaging to her White House battle as their voting for Trump. Even though she's crossed the delegate threshold, Clinton is in a precarious spot: she has to strike a balance where she doesn't appear too far to the left of Trump, who's her real competitor now, nor too far right of Sanders, whose influence will certainly be felt, even without a contested convention.